A trio of revival albums from the legendary Little Richard – all of them pretty darn great! First up is the funky Rill Thing – a stunning comeback session from the start of the 70s – recorded at Muscle Shoals with a heavy funk component in the mix! Richard arranged and produced the record himself – and it's a beautiful illustration of his genius – hardly dimmed at this point in his career, and if anything, really redefined for a new generation – with some razor-sharp grooves that are perfect for his hard-wailing vocals! The title cut – "The Rill Thing" – is a monster 10 minute instrumental jam, with a heavy funk sound that you can't even begin to imagine – and the rest of the set is pretty amazing too, with tracks that include "Spreadin' Natta What's The Matter", "Freedom Blues", "Two Time Loser", "Somebody Saw You", "Lovesick Blues", and "Greenwood Mississippi". Next is King Of Rock & Roll – a much rootsier set than some of Little Richard's other work for Reprise Records – a record that almost goes back to the old days, but via the hipper styles of the early 70s! HB Barnum arranged and produced the set, but the groove is less funkier than some of Barnum's other work of the time – a bit more rockish in some of the rhythms and instrumentation, which is no surprise considering the title – with a nod back towards late 50s modes, but in that new-roots way that Warner was hitting with other artists of the period. Richard's vocals hold up very well in the setting – and apart from the original tunes "Green Power" and "King Of Rock & Roll", the album features versions of "Midnight Special", "Dancing In The Street", "Brown Sugar", and "Born On The Bayou". 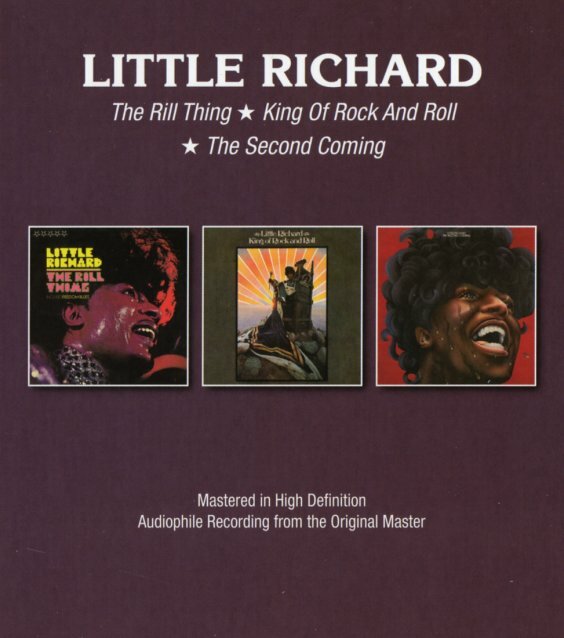 Last up is Second Coming – funky 70s Little Richard – very much in the spirit of his Rill Thing album, although a bit more polished! The album features production and arrangements from New Orleans soul legend Bumps Blackwell – who first handled Richard way back when – and the record's sort of divided half and half between tracks that have a 70s funky feel, and others that are going back for more of an older styled retro rocking groove – yet not nearly as much so as on Richard's previous Reprise album. Titles include "Nuki Suki", "The Prophet Of Peace", "Thomasine", "Second Line", and "It Ain't What You Do It's The Way How You Do It". © 1996-2019, Dusty Groove, Inc.